At the start of Melbourne’s famed Yarra Valley, a haven for food and wine production, the town of Healesville has long been a noted staging post – not least for the very well-regarded Healesville Hotel. A finalist in this year’s Good Food Guide Awards for regional restaurant of the year, it was high time Greedy Girl and gluttonous husband jumped in the car for the hour and a half trip from the city. Late winter is a lovely time of year for the road trip. Everything’s green en route and a few trees are already in spring blossom. The hotel is on the high side of the main road going through Healesville and there are a few hardy souls sitting at the alfresco tables. There are, however, few country pub dining rooms that aren’t improved by the presence of an open fire, which is exactly where we headed. The main restaurant is called ‘Quince’. It’s a large, light room with a bar tucked away in one corner and the fire in another. A tasting menu is on offer but this particular Saturday, we opted for a la carte. While there were several dishes we’d happily tuck into, it was more difficult to find a wine. The list is unbelievably extensive but the number of wines by the glass is limited. 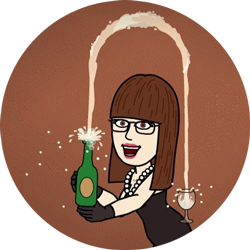 Greedy Girl started with a local pinot noir while gluttonous husband opted for a pale ale. While the beer was appreciated, the pinot was unremarkable. Ne’er mind. We tucked into some grilled bread with a green, peppery olive oil and awaited our first courses. Greedy Girl’s dish was incredibly pretty. 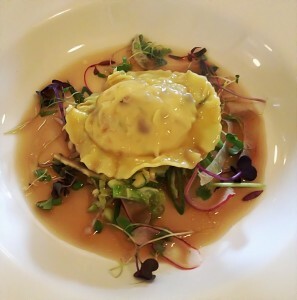 The raviolo was filled with confit duck, served on a bed of cabbage, spring onions and mushrooms and finished with a duck consomme. The confit duck was delicious, with plenty of oomph but the cabbage was very strong and almost too dominant. No mushroom flavour could be discerned unless one was eaten in isolation. The consomme was poured at the table but it lacked flavour. Greedy Girl sprinkled a little salt on her forkful before passing the plate over for gluttonous husband to try. He immediately also went for the salt saying the dish needed more seasoning. 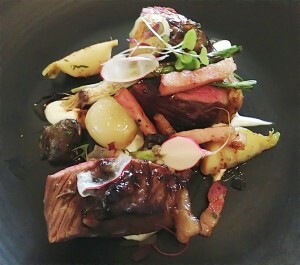 To mains and Greedy Girl chose a special of local Wagyu sirloin, with root vegetables, garlic puree and a truffle jus. Asked how she’d like her meat, Greedy Girl trotted out her customary ‘medium rare’. Two gigantic slices of beef soon appeared in front of her, glistening a deep ruby colour. This was the rare side of rare. Gluttonous husband, he who orders his steak ‘blue’, was utterly delighted. Greedy Girl ate around the seared sides of each slice and left the very underdone centre for gluttonous husband to hoover up. The dish was devised with baby beetroots which Greedy Girl asked to be withheld – gluttonous husband chimed in with the statement that the world would be a better place without beetroot, Greedy Girl heartily concurred. The meat was very tasty (sirloin having a bit more texture than other cuts) and the root vegetables as well as some roasted Jerusalem artichokes worked well. A highlight were some battens of smoked bacon. The garlic puree was delicious but overpowered any chance of being able to taste a truffle jus. It was an enormous serving. Gluttonous husband chose the duck. It was a corn fed duck breast from Bendigo, served with roast parsnip and pear, toasted seeds and chestnuts. The breast had crispy skin (a big tick from gluttonous husband) and the confit leg had been deboned and was also crispy. Both pieces were cooked well; even though the breast was quite rare, it was far from chewy. The seeds didn’t really have any great flavour but helped texturally. We had an excellent dish of roasted, crispy potatoes on the side and were treated to a complimentary salad of leaves from the garden with an unusual, but tasty sweet dressing. Given the serving size of the beef, there was no room left for dessert. Gluttonous husband ordered an espresso, which came with two pieces of a quince and hazelnut ‘truffle’. We asked for the bill and prepared to depart. The food was quite good, if not exactly a rave. Gluttonous husband concluded he’d made the better choices on the day. The setting is pleasant, with plenty of period features but on a quietish lunch service there wasn’t much in the way of atmosphere. The service was functional. The wait staff were professional, if not personable and didn’t seem to want to engage in any major way. Greedy Girl would have enjoyed quizzing them about the produce/wine provenance but they weren’t outrageously forthcoming. 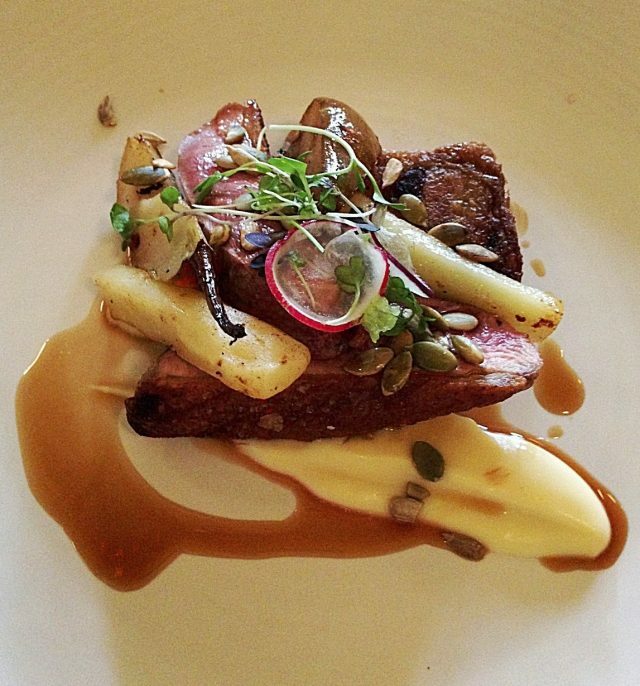 A visit to the Healesville Hotel had been on our foodie list for some time. We can honestly say we’ve now ticked that off. Undoubtedly it will get a further fillip as a finalist in Victoria’s regional restaurant of the year award but Greedy Girl has had a great many more memorable food outings in rural centres than this one.